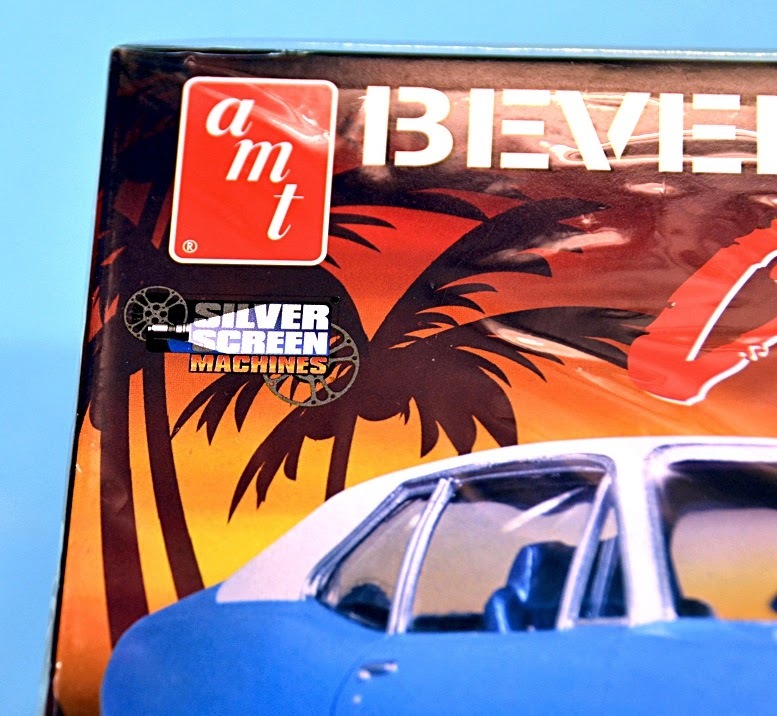 This is another 1:25 scale ‘Silver Screen Machines’ kit from Round 2, featuring a vehicle from the movies. 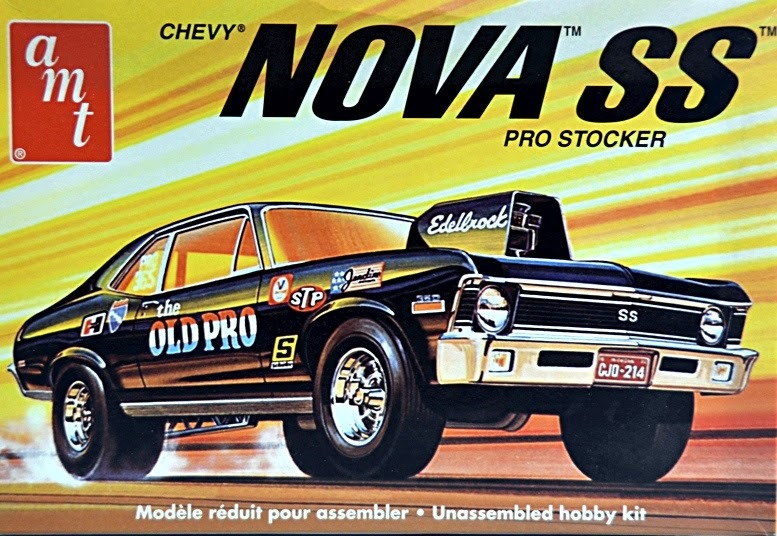 MAT IRVINE: The kit is a reissue of the AMT Chevrolet Nova, first issued in 1972 as the Nova SS Pro Stocker. 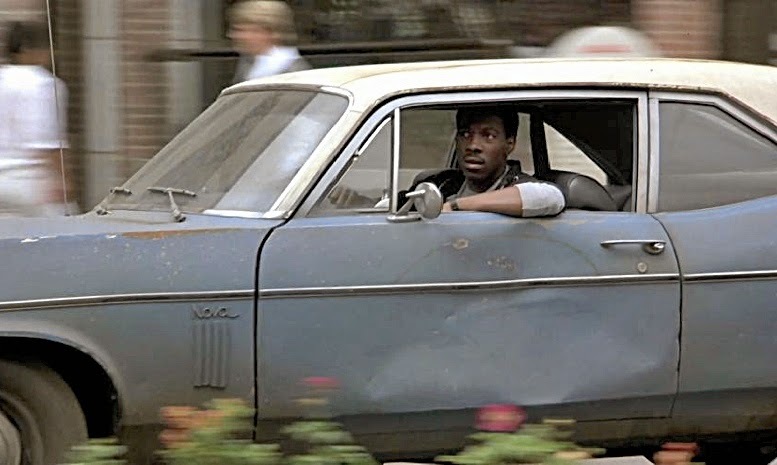 This time, it is boxed as the drive of street-smart detective Alex Foley, as played by Eddie Murphy in the 1984 movie, Beverly Hills Cop. 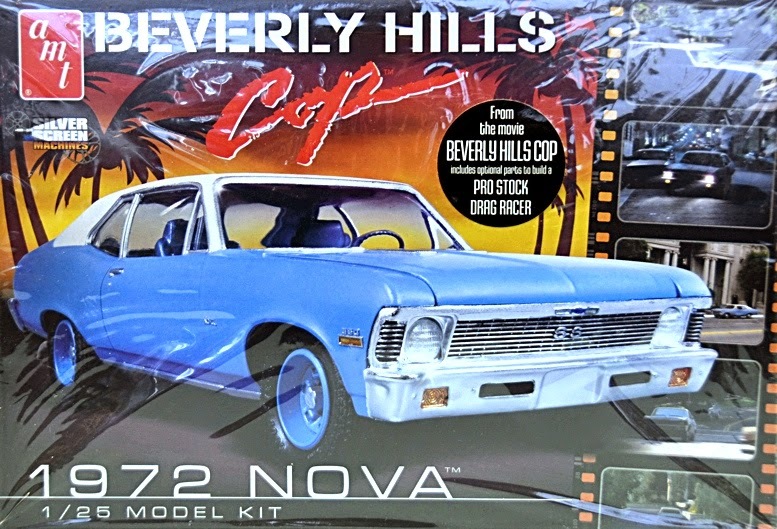 However, there is a slight problem with the kit, because it represents a top-of-the-line Nova SS Super Stock, whereas the movie star car was indeed one of the ‘crappy blue’ run-of-the-mill versions. I corrected the hood by sanding off the intakes (above) while the small side vents (below) were added from textured plastic sheet. Note the printout of movie screen grabs, an invaluable reference source. 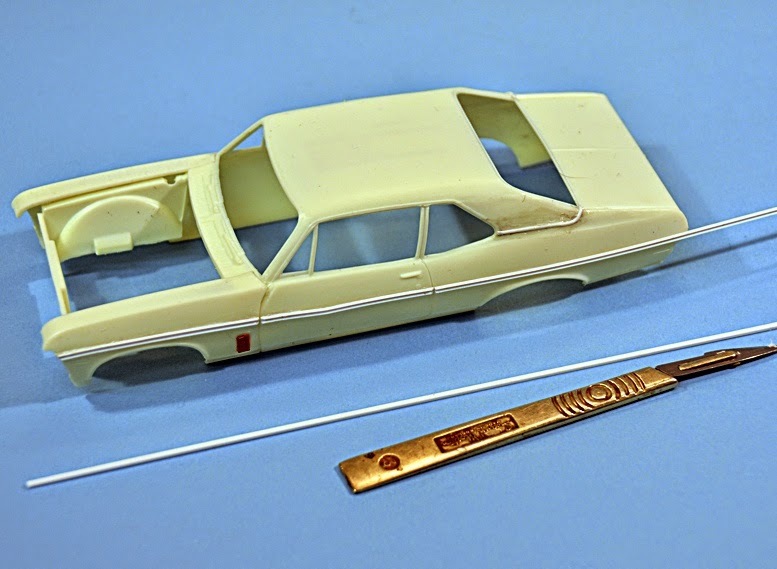 The side strip (below) was reproduced by adding the smallest Plastruct channel mouldings available, supplied by the accessories specialist little-cars. The strips were cemented into place, sanded to remove some of the thickness, then - after the main body was sprayed - covered in Bare-Metal Foil, a black centreline being added with a wash of thinned black paint. 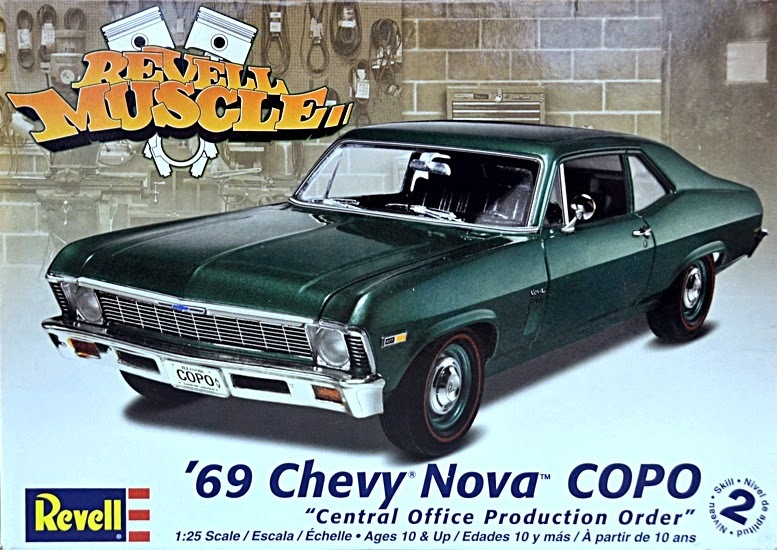 The grille and wheels were slightly more difficult and in the end were the result of a compromise, being borrowed from a Revell 1:25 scale Chevy Nova COPO kit. 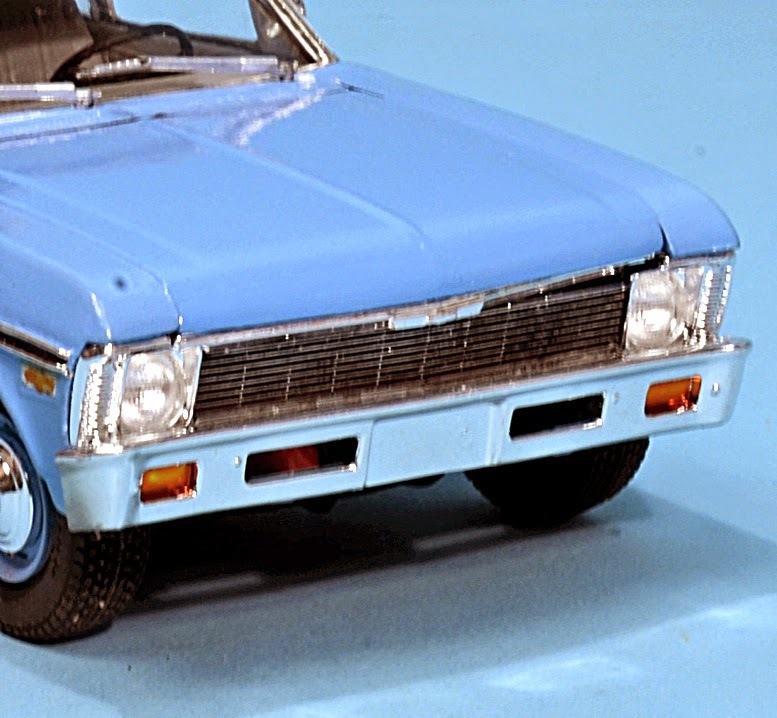 The grille in this kit (ref 4274) is stock, without the ‘SS’ logo, and is a near-exact match for the AMT kit. It just drops into place, which may prove something. 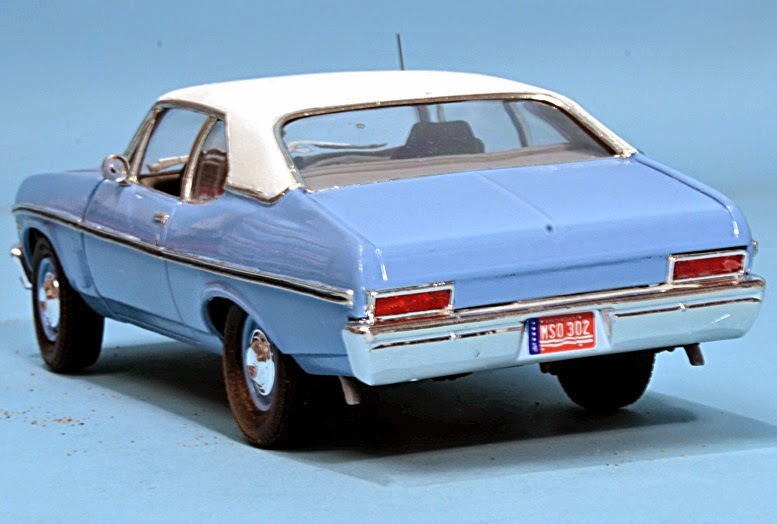 The Revell kit also donated stock wheels, with small chrome embellishers. However, the AMT kit’s rear bumper was used. This had the SS logo removed, being replaced with a strip of plastic card, matched to the body colour. Chopping SS from the chrome rear bumper (above), replacing it (below) with sheet styrene. 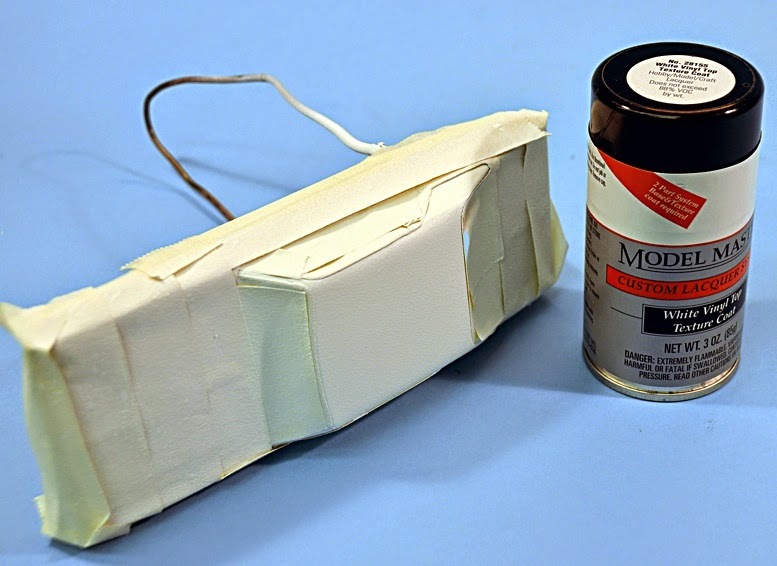 The vinyl top can be created by using a White Vinyl spray from Testors. If that’s not available, a thick mix of matt white can do the job, or you could perhaps use packing tape with a textured surface. 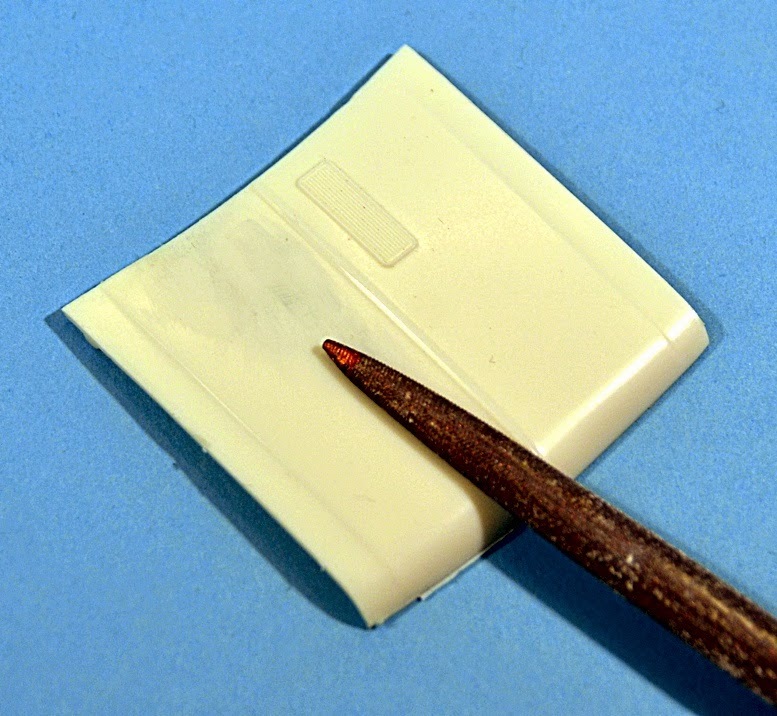 You may even find an old AMT kit with sticky-back vinyl material in the box, as this was an extra included in many 1960s Annual kits. However, I used the Testors spray, after masking off the rest of the body. 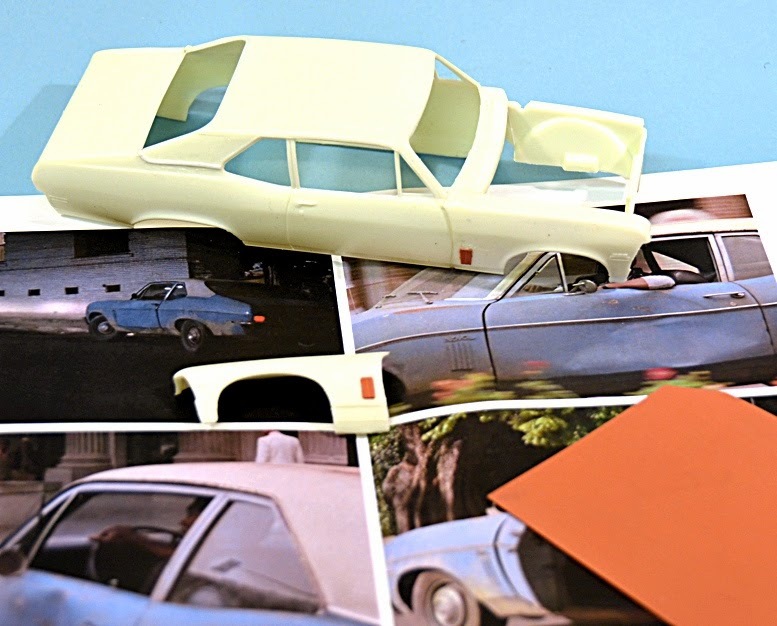 The process was then reversed, with the roof masked off for the light blue body coating. This was Testors Blue 1208, but other model paint companies make similar shades. When the paintwork was thoroughly dry, the roof masking was removed and chrome trim applied all round, using Bare-Metal Foil. 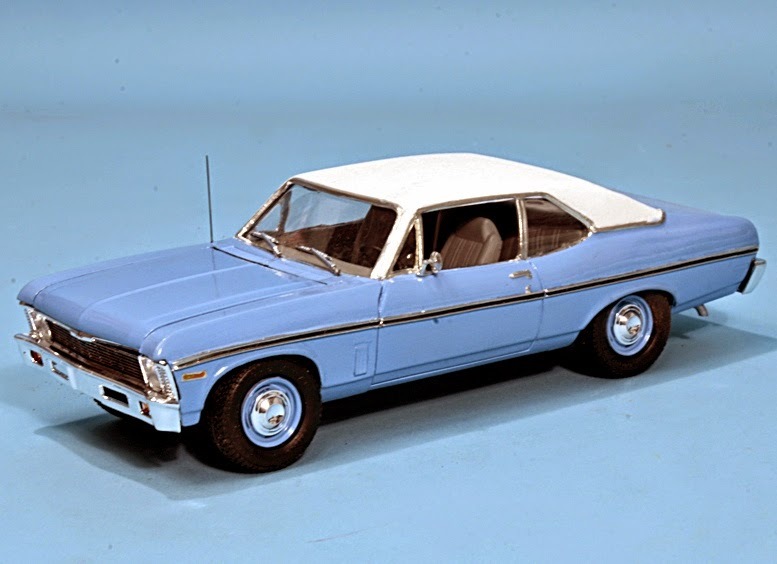 The car was, after all, made in the era of chromed windshield surrounds, as well as trim. 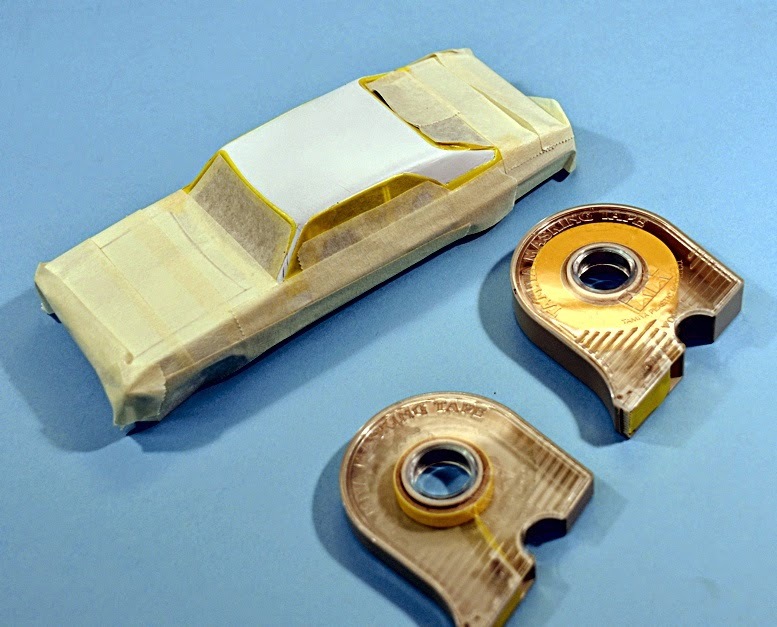 Masking the body (above) involved using Tamiya tape (yellow) for delicate areas around the windows, while ordinary masking tape (white) was suitable for the rest. Below, the vinyl roof has been sprayed, but still has masking in place. 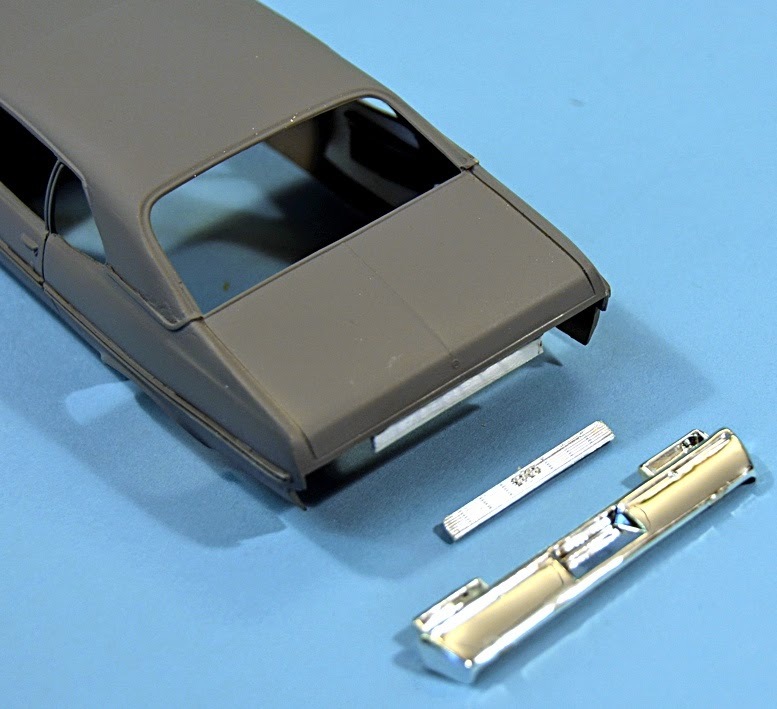 I sprayed the Nova's interior a basic mid-grey for all surfaces, including seats, side panels and floor. 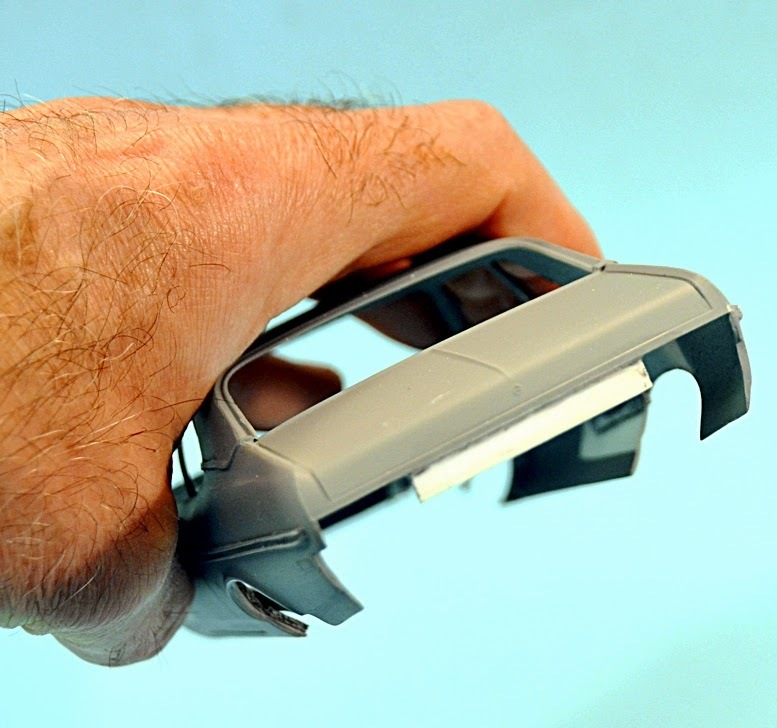 Two additions I made were a single rear-view mirror on the driver’s door, obtained from the spares box (though there is one in the Revell kit) and a radio aerial on the opposite side. This was made with very thin metal wire, as a plastic equivalent isn’t really thin or strong enough. Finally, of the two different licence plates supplied in the kit, MSO 302 (above) is the correct one to use, and you only need to apply it to the car’s rear end. 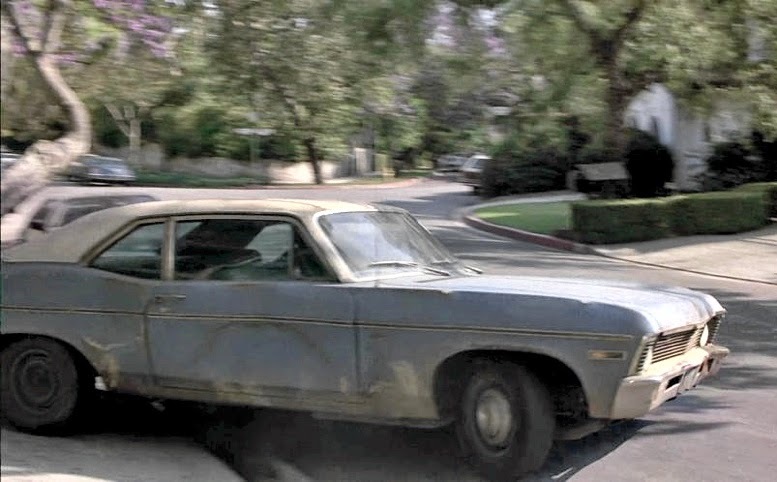 In the film, Foley’s vehicle was registered in Detroit, Michigan, one of 19 US states where only a license plate at the back is needed, all other states requiring one at the front as well. The kit, however, provides two plates. There are arguments - as is common when it comes to discussing screen star cars - about the pedigree of the actual vehicle used. 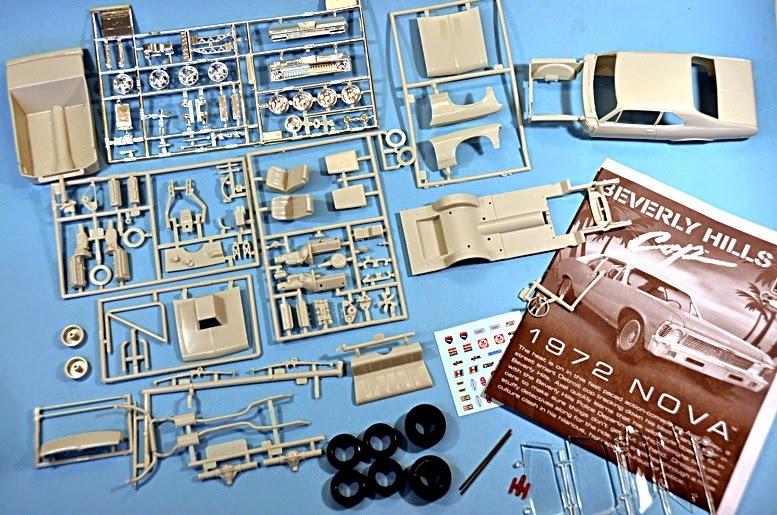 The kit represents the 1972 model, while the movie version is supposedly a 1970, though some say it’s a 1969 car, with 1970 front fenders. 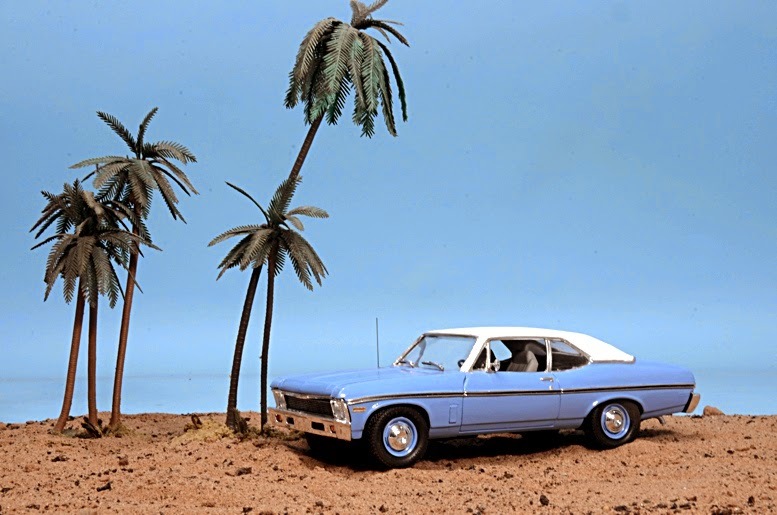 But no matter - from 1969 to 1972 the Nova remained much the same, and it’s almost certain that several, more or less identical cars were used for filming. 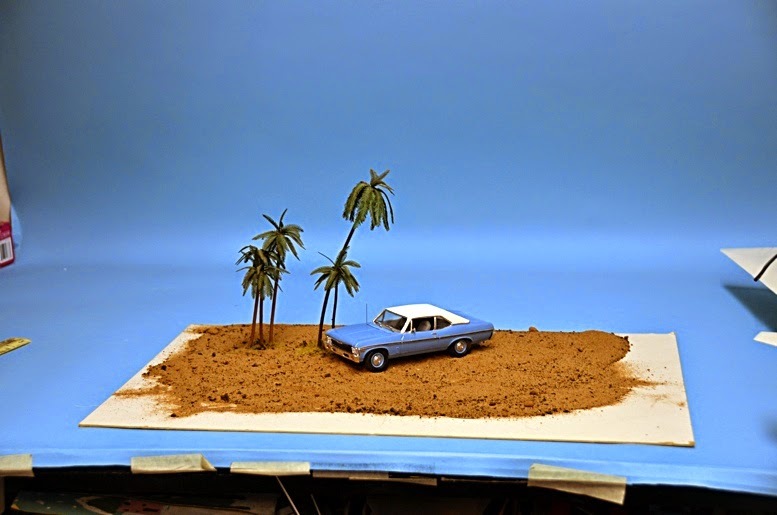 I built this diorama setting to mimic the kit box’s Los Angeles setting. 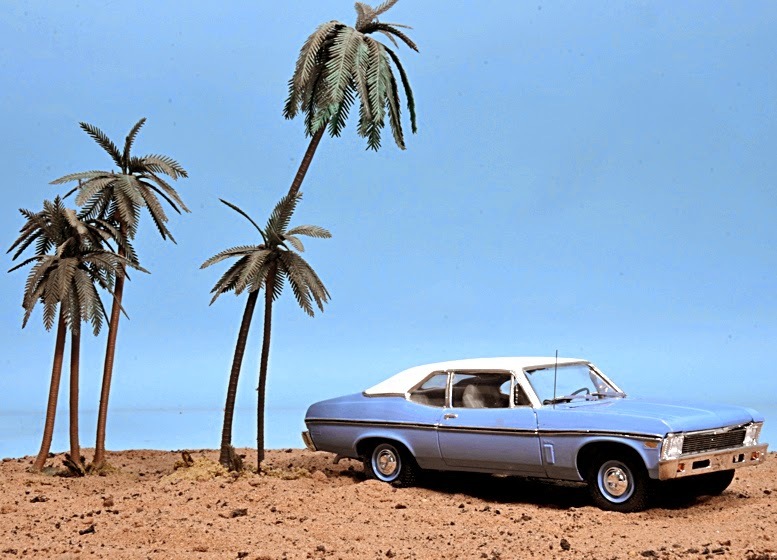 The palm trees were originally from UK manufacturer Britains, though they are long out of production, unfortunately. 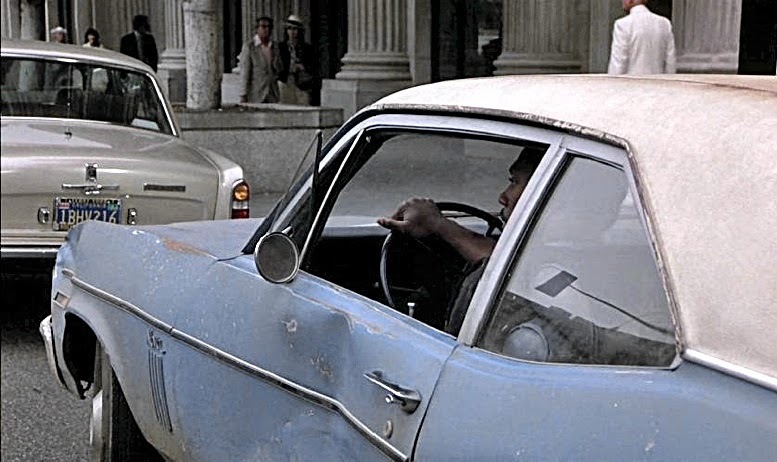 Screen grabs from the movie - dents are optional! 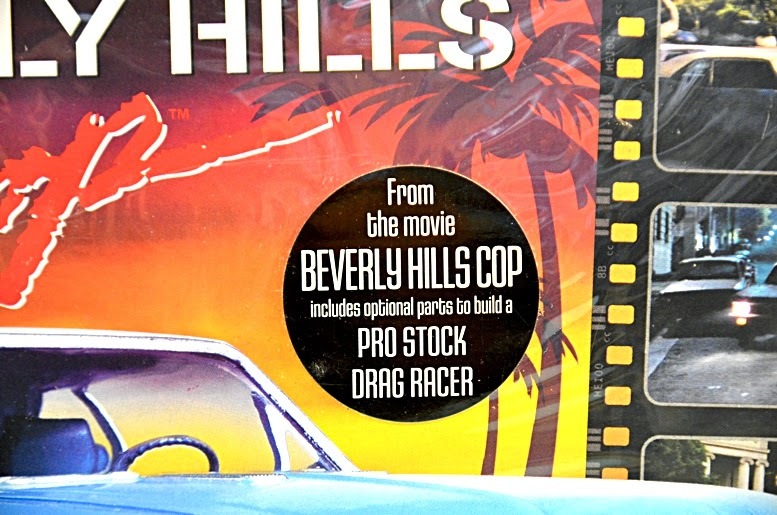 The original 1972 issue (below) and - nice, this - the Beverly Hills Cop version still comes with enough parts in the box to build a Pro Stock racer, if you wish.